Hello everyone, and welcome to my new home. After over three years of writing for other MTG Finance websites, I’m delighted to reach a broader audience here at MTGPrice.com. The opportunity is truly energizing, and I look forward to engaging dialogues each and every week. To that end, I encourage you to please share your thoughts – both positive and negative – in the comments section whenever you’d like. Before I jump into my financial content for today, I wanted to first share a brief overview of my background. This context will really foreshadow many of my future topics, underlining my general approach to MTG Finance. Allow me to explain. Technically, I’ve been playing Magic for about 18 years now…well, if you consider casting numerous Craw Wurms and Dark Banishings “Magic”. For over a decade I was solely a casual player; never understanding the allure of tournaments or adhering to certain rules dictated by various formats. Finally around Time Spiral block I dipped my toe into the competitive waters. I couldn’t understand why a card like Strangling Soot was so good, and why my first picking of Pardic Dragon wasn’t winning me games. It was the rare, after all! My defeats were swift and merciless. Clearly, there was much to learn. A couple years later I was introduced to the concept of MTG Finance at my local card shop by a couple of influential members of the community. 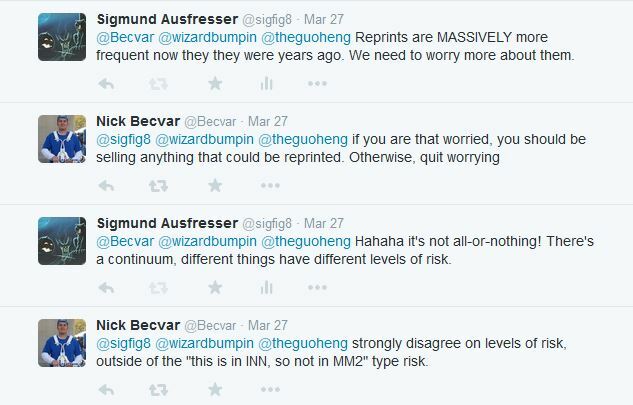 I distinctly remember asking the question that changed my perceptions of MTG Finance forever. My paradigm of Magic was changed forever. I had finally realized the power of knowing not only the value of my cards but the value of others’ cards as well. I also discovered that cards had wildly fluctuating prices, which lent themselves to opportunistic exchanges and investments. Needless to say, I was immediately hooked. My soul purpose for attending local events suddenly became about trading, not battling. The methodology was easy to pick up, I signed up for a Twitter account to follow other MTG Finance experts, and the rest is history. What’s left out of the story above, however, is my primary motivation. At first my goal was simply to avoid losing/spending money to play Magic. I learned a very difficult lesson after Psionic Blast went from $25 to under $5 after Time Spiral block rotated out of Standard. I had no idea rotation was a thing, and I certainly regretted giving up so much value for the under-appreciated Blue instant. After these unfortunate trades, I swore I would pay much closer attention to financial trends. Fool me once, shame on you. Fool me twice, shame on me. Through frantic research and continuous education, I learned how to not only avoid pitfalls such as these, but also how to trade into cards with potential appreciation. A cautious approach was my friend, ensuring I didn’t move into any cards too rashly. About a year later my spouse gave birth to our son, and my priorities changed dramatically. Finding inspiration from a kind gesture from another member of the Magic community, I decided I’d refocus my efforts in MTG Finance with a new goal: to make money from the game so as to offset or cover college costs for my son. Three years later I can confidently say I’ve made a small dent in the projected cost of his education, but I know I have a ways to go. This new-found motivation to pursue MTG Finance segues nicely to my financial topic for this week: risk. Everyone manages risk differently and in an uncontrolled, often manipulated market there is a full continuum of risk/reward strategies one could pursue. We’re talking extreme opportunities here. Ranging from buying one case of every new set to sit on for ten years (on the conservative end) to buying 1,000 copies of a seemingly bulk rare such as Amulet of Vigor, only to see a 1200% return over an 18 month time period. I often hear about how difficult it is for even the most adept hedge fund managers to beat the S&P 500 on a consistent basis. If only they heard about MTG Finance! The reason I bring up this risk continuum is because I share where my strategy lies, for context. Generally I am a risk-averse person. I also have a lingering fear of MTG Finance in general – the secondary Magic Card market is easily manipulated and unregulated, controlled only by Hasbro’s whim. Therefore I make a point not to overextend my exposure to MTG. Everyone has their financial flexibility and limitations, and I’m comfortable with my allocation to investments in this game. Additionally, I strive to keep my goal in focus. If I truly hope to put a dent in my son’s college education costs 15 years from now, I can’t go around taking dramatic risk. The reward potential may be large, but losing significant money in this game could set me back years. Therefore, I focus on a strategy of diversification. I try my best to allocate capital towards an array of targets, including cards from Vintage, Legacy, Modern, Standard, Commander as well as sealed product. This way if any format were to suddenly drop in popularity or shift dramatically I wouldn’t lose too much at once. It’s a strategy I borrow from Wall Street investing and it has worked well for me thus far. Wizards of the Coast has decided to tap into the powerful secondary market by creating more and more products with reprints. Can you really blame them? Duel Decks, Event Decks, Commander products, From the Vault series, more and more judge promos, Modern Masters, and all these old set rehashes (e.g. Return to Ravnica, Scars of Mirrodin, and Battle for Zendikar) – every single one has given Wizards of the Coast an opportunity to increase sales by bringing back strategic valuable cards from old sets. And while the reprint is nothing new, their frequency is surely alarming to a conservative speculator such as me. How do I manage this new risk? 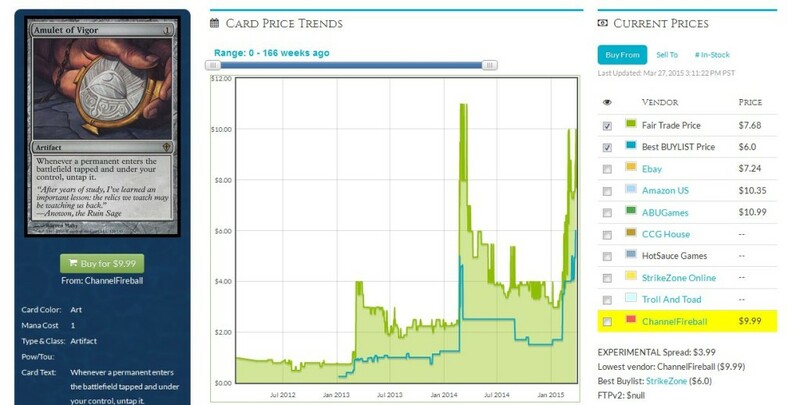 Besides diversification, I’m a strong believer that certain cards are more prone to reprint risk than others. My strategy is to identify the lower risk cards which see plenty of play and move in accordingly. This goes beyond sticking with newer cards cleared from MM2015 such as Snapcaster Mage, mind you. While Snapcaster was a terrific buy a couple months ago, I think there are some other less obvious pickups which should be relatively safe from reprinting. I should point out that not everyone agrees with this sentiment. A recent Twitter conversation was the first time I recognized the dissonance in community opinion. I have complete respect for Nick, but my opinion was not influenced by Twitter debate. Since I have more than 140 characters to work with, I’m hoping I can share my perspective here. 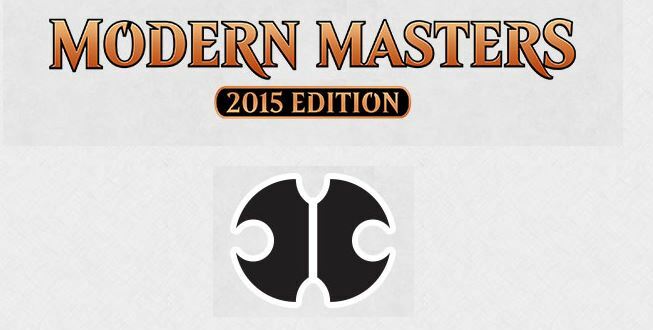 Let’s start with a premise: Wizards of the Coast does not want Modern Masters 2015 to be too much like Modern Masters. If there’s mostly overlap between sets, the new product won’t have a new “feel” to it. Players wouldn’t like this. 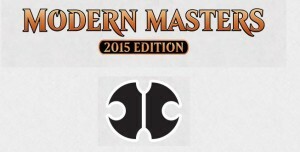 Additionally, the new Modern Masters 2015 set will have a broader menu of sets to include reprints from. The first MMA set contained cards ranging from Eighth Edition through Alara Reborn. Yet MM2015 will contain cards all the way up through and including New Phyrexia. The larger pool of cards dictates most the MMA cards cannot reappear in MM2015. While true, let’s look at this with a little pragmatism here. Tarmogoyf continues to be the most expensive card in Modern despite getting the reprint treatment in the first Modern Masters. In fact, the value of the Green creature went UP upon reprinting. This means two things for WOTC. First, they have license to reprint this card again knowing another printing at Mythic Rare won’t absolutely destroy Tarmogoyf’s market value. 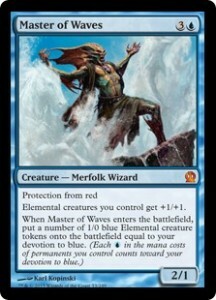 And second, they would be crazy not to include him in the new Modern Mastsers set. That card alone is going to sell the set. Suddenly paying $9.99 for a pack is less worrisome when you know you can open up $200 in a single card. So while there will likely be a few other strategic reappearances, I still think this set will be designed to have a different “feel”. New mechanics will appear (e.g. annihilator, metalcraft) and Wizards will need to print sufficient cards to support those strategies in draft. There are also a good deal of valuable cards in the newer sets of MM2015, and these cannot be ignored. With all this said, I stand by my tweets above: some cards are less risky than others. 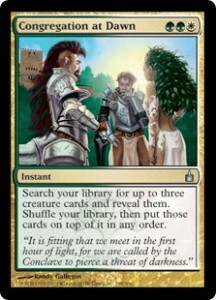 For example, Pact of Negation, Slaughter Pact, and Summoners’ Pact got the reprint treatment in MMA. I don’t anticipate they’ll show up again. That would be three repeat slots taken up, and I just don’t think they’ll come back. There were also only fifteen Mythic Rares in MMA. 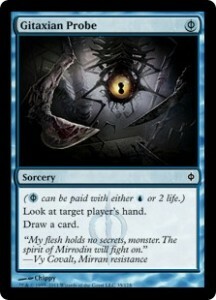 We already know Goyf is coming back as one for MM2015. How many repeat Mythics will show up? With a bunch of Eldrazi, Mox Opal, and a few other expensive, newer cards to reprint I can’t imagine we see too much overlap in the Mythic Rare department. Vedalken Shackles still hasn’t recovered fully from its reprinting and is unlikely to come back. Or how about the two swords we got in MMA? Wouldn’t it make more sense to see two of the newer swords in MM2015, such as Sword of War and Peace and Sword of Feast and Famine? And forget the Dragon Spirit cycle – that’s five relatively cheap Mythic Rares no one wants to open in a $10 pack. Net, I don’t only believe some cards are more reprintable than others. I believe we can strategically mitigate risk to our portfolios by anticipating which cards are unlikely to show up for a second go around. I doubt I’ll predict things perfectly, but if I can use any information available to me to avoid taking unnecessary losses on cards, you’d better believe I’m going to do so. Often times, that’s what the name of the game is – using information available to us as best as we can to try and create an edge. It’s that edge that leads to sustainable, consistent profits. It also adds discipline to our approach, ensuring we think through our investment decisions before committing funds. And in a world of rampant buy-outs and needless hype, strategic thinking is even more critical in order to avoid pitfalls of baseless speculation. Hopefully my introductory article here on MTGPrice covered the backdrop for how I approach MTG Finance, while also hinting at some worthwhile targets in trade. Something like Pact of Negation is unfortunately already $20+, but it’s also the only played free Counterspell in Modern. It also sees occasional Legacy play, which makes the card even more attractive for the long run. And with its appearance in the first Modern Masters, you could do worse than to trade into a few copies if you’re looking for slow, stable upside. Other safer targets include Engineered Explosives (my number one Tiny Leaders target), Glen Elendra Archmage, and Lotus Bloom. In the future I hope to look beyond Modern and share some of my favorite targets in other formats, along with how I’m currently allocating my funds toward each format. I’ll explain why I think Dual Lands have pulled back significantly over the past few months, and why I see that trend reversing very soon. I’ll share the economic theory behind rising prices in the Vintage market. And I’ll share my misadventures in the sealed product space. With so much to discuss, along with a backdrop of an ever-changing environment of buyouts and new sets, I hope to be writing for MTGPrice for years to come. I look forward to each and every week. Each week, in addition to my actual article, I like to share three interesting tidbits worth noting based on Star City Games’ stock. The information is shared in rapid fire fashion, and the reader is left to interpret the implications and act in the way they deem best. 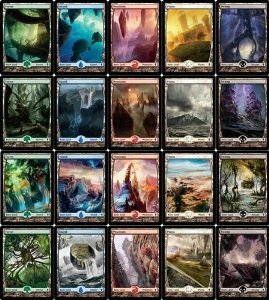 I hope to continue this practice here at MTGPrice.com, and I’d appreciate comments from readers as to whether or not this section is well-received. 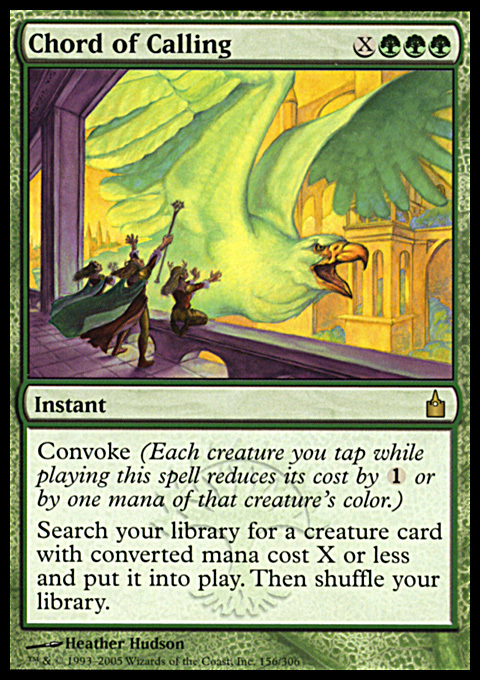 As long as Affinity remains popular in Modern, Stony Silence will be a worthwhile card to acquire. And with the likely inclusion of metalcraft in MM2015, perhaps the interest in this archetype will increase even further. Star City Games currently has just 3 copies in stock, with a price tag of $4.45. Why do I think at least some Dual Lands have finally bottomed? Well Volcanic Island’s stock at Star City Games has continued to dwindle. They now have just 13 total Revised copies in stock, with NM copies listed at $299.99. After dominating the Dual Land world for decades, Underground Sea may finally lose its status as “most expensive Dual Land”. It too retails for $299.99 but SCG has 45 total copies in stock, although none are NM. Foil Command Towers are still tough to come by. Star City Games is still only charging $29.99 for both Commander’s Arsenal and judge promo copies. Though, it’s worth mentioning they are sold out of each. I suspect they increase their prices when they restock. Hey, everyone! You might remember me from brainstormbrewery.com, where I’ve been writing Magic finance articles for the past year and a half. You might remember great classics as Be Your Own Buylist, Checking in the Closet, Power 10, One More Card, The Nekusar Effect, Common Rares, Rent a Car(d), and Wizards has Never Done That! If I had to give a list of my articles that I’m most proud of and feel are the most informative, I think that’s a pretty comprehensive list. Hopefully, this week’s bundle of words is going to be one that gets added to that list. While I will no longer be writing finance content for Brainstorm Brewery, you can still read my articles here on MTG Price every week, and I’ll still be working with BSB in one shape or form. Thanks for sticking with me! The word of the week (and month, and next couple of months), is dragon. Dragon, dragon, dragon. Dargon, winged wyvern, scaly fire-breathing lizard, Shivan—however you want to say it. Dragons are the talk of the town, in both the casual realm and the finance world. Everyone’s hunting down the next Scion of the Ur-Dragon, as if they were the Khans in the first set of the block. While there are so many people rushing to pick up cards that they’re expecting to spike, I’m leaning towards liquidating some cards that are either dead weight at this point, or are likely candidates for reprinting in the near future. Modern Masters 2015 is a mere two months away, and so is Grand Prix Las Vegas (with GP Chiba in Japan and GP Utrecht in the Netherlands being played simultaneously), so I’m looking to start getting rid of the inflated Modern staples that have a shot at being in the set. There’s also Magic Origins on the horizon, not to mention From the Vault: Angels coming out toward the end of the summer. There are lots of opportunity for Wizards to reprint some of the more valued cards in various formats, so I’m looking to stay clear of being hit too hard by selling early. I want to reinforce that the idea of this article is less of a “What do I think will be in Modern Masters???!! !111”, and more of a “I think these cards are too risky to hold onto in the short term, and I am looking at liquidating them in the next couple of weeks.” Some of you might be more inclined to hold these cards for a bit longer, but I prefer to avoid as much risk as possible, and just lock in what I can, when I can. New Phyrexia is the most recent set that MMA2015 will contain, and it’s already confirmed to have a higher print run than the original set. But how much larger, you ask? Well, we can’t really say as of yet. However, it’s safe to assume that Wizards has realized the mistakes that occurred in 2013, and will be rectifying them in 2015, at least to a degree. 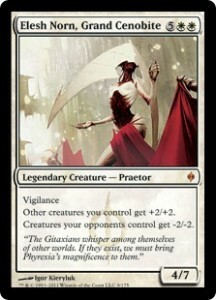 What’s important to take away here is that if they get reprinted, some praetors will take a bigger hit than others. Elesh Norn is the biggest red flag here, at $33. If she’s not reprinted, she probably continues to creep upward to $40, but I’m jumping ship here while I can lock in money. 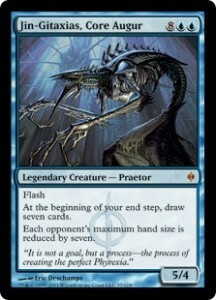 I don’t want to own any Praetors that I’m not using come May. Gitaxian Probe is a $3 common. Let that sink in for a moment. It wasn’t printed a decade ago like Serum Visions was, but it’s still $3. Maybe there’s a chance of it creeping up towards $4 in the longer term, but I don’t really care to have any part of that. I’m happy buying these across the buylist table at $1, and shipping them for $2 or $2.50 out of my local display case. While Phyrexian mana is pretty awkward to have to reprint, Modern Masters is pretty much the perfect excuse to do it. Did you know that the cheapest edition of Bolt is also pretty much $3 at this point? It’s the most popular nonland card in Modern, according to MTG Goldfish. The last time it was printed was in the Premium Deck Series: Fire & Lightning set, and before that was M11. If it’s not going to be in MMA2015, I can see it being put into another casual product like a Duel Decks or Commander product. I had these in my spec box when they were $1, and now I believe they’ve ripened to the point where I want to harvest the crackling energy that is pure profit. 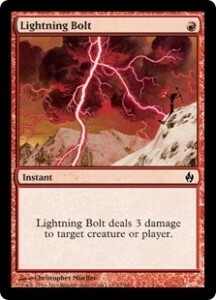 That being said, this isn’t something I would liquidate in an emergency if you’re running them in a deck. At the most, you’ll probably lose $6 per playset if it’s put into a supplemental product. I just wouldn’t advocate holding onto extras or stocking up on additional copies expecting a continued climb for too much longer. If you haven’t heard, this recently jumped up in price to $3 because of speculation on a new (well, semi-new) Modern combo with Collected Company. 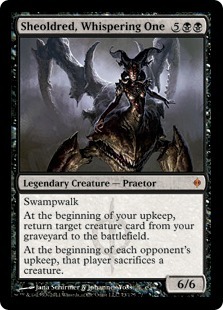 The idea is to tutor up three small creatures that can go infinite together, then slam them all on the board at once with the new Dragons of Tarkir rare. Personally, I think the combo is a bit too clunky, and it’s trying too hard to be what Birthing Pod used to be. Foils have jumped up to $15 on the low end of eBay, but I’m still not upset about getting rid of the one I had at $12 while it was on the rise. While the card is getting increasingly hard to find due to lack of reprints, I’d get out now if you managed to buy in for cheap. Once Nightveil Specter took a vacation, Master of Waves was lonely, and sank into a deep financial depression. Until Dragons of Tarkir came along and a newfound friend appeared! Because of Shorecrasher Elemental’s reveal, there were rumors spread throughout the community. Is Mono-Blue Devotion going to be good again? Should I buy a significant amount of Master of Waves, and be prepared to sell them for $20 like I did last year? Apparently the answer to all of those questions was a resounding and presumptuous “YES!” Unfortunately, that’s not exactly what I expect to happen. While it has jumped from $3 to $7 in the past couple of weeks, I’m advocating that you also make a jump of your own: out of your copies of MoW that you already own. Even if Devotion becomes a deck again, there’s no “Wow” factor this time at a pro tour to make everything’s price go absurdly crazy. Get out while you can, there’s really no financial hope for Master of Waves in any other format than Standard. Ever since these were inserted into the Zendikar and Worldwake booster packs, I remember people saying, “I’m stocking up on these, they’ll be the next Unhinged lands,” or something to that effect. Well almost six years have gone by, and these still have barely breached $1.50 each, let alone the $5 that was predicted by many. Instead of becoming hard to find chase basics that show off how regal an individual’s deck is, the non-foil ones are mediocre for “blinging out” purposes, and have mainly been relegated to cubes and Limited players’ arsenals for a cheap alternative to Unhinged. If you were hoping for these to pay for your retirement, I’d stop and give it up already. This slow to non-existent growth is accompanied by the fact that we’re returning to Zendikar this fall, and there’s a non-zero possibility that Wizards decides to include some nostalgia in the packs by reprinting these full-art lands. Instead of keeping the ZEN full art lands in your spec boxes, they’re probably best kept for personal use or unloaded to move cash elsewhere. While I think the foils are still a fine pick-up in trades, I wouldn’t touch the non-foils unless you get them as throw-ins for practically free. The little anti-Twin that could has slowly climbed higher and higher these past few years, and as its increasing utility in Modern grows, the number of existing copies stays the same. If Gitaxian Probe manages to see a reprint, ‘Skite will almost certainly be in the same boat. I don’t think there’s enough potential left in the Phyrexian mana magnet to warrant holding onto copies if you’re not actively sleeving it up and sending it into battle, so I recommend unloading extra copies while you have the chance. Channel Fireball is offering $15 cash for copies while I’m writing this article, which seems like a darn good deal to me. If ‘Skite is shown to be in Modern Masters this year, I can’t see it staying above $10, maybe even $5 depending on the print run. Last, but certainly not least on the pricing spectrum, I want to talk about the candidates for the upcoming From the Vault: Angels. While the product doesn’t come out until later this summer, there are a couple of cards that I’m still wary about holding due to the fact that they could be in the FTV or MMA. There’s very little to be gained on either of these cards, and I have multiple copies of each on TCGplayer right now, to put my money where my mouth is. This card is approaching $40 through casual appeal alone. It’s fine in EDH, sure, but other than that? Pure. Casual. 78-card mono-angel-tribal land. That’s where this card sees play. 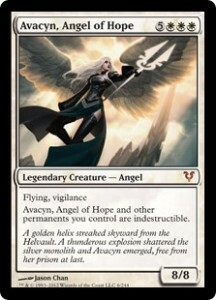 I don’t think Wizards wants its Legendary Mega-Mythic Super 8/8 Angels™ to be $40, at least not just a few years after being printed. I’m going to sound like a broken record at this point, but if you’re not using them; sell them now. Although Linvala sees a tiny bit of Modern play as a one-of to shut off value-based creature strategies, she sees even less play now that Pod got the axe. A prime target for either of the products we’ve been talking about in this article, Linvala’s price stagnated at $50 for the entire year of 2014, before starting to creep down, presumably because of the FTV: Angels announcement. She’s $42 right now, but I would try and unload her before anything else happens. Anyone else have a list of hot potatoes that they’re trying to get rid of? How about those Zendikar fetchlands? There’s been a decent amount of controversy as to how “obvious” it would be if they slammed the enemy fetches into Battle for Zendikar this fall, but I’m on the fence myself. I’m still definitely selling off all of my extra Misties, Mesas, and Tarns at the moment, just in case. 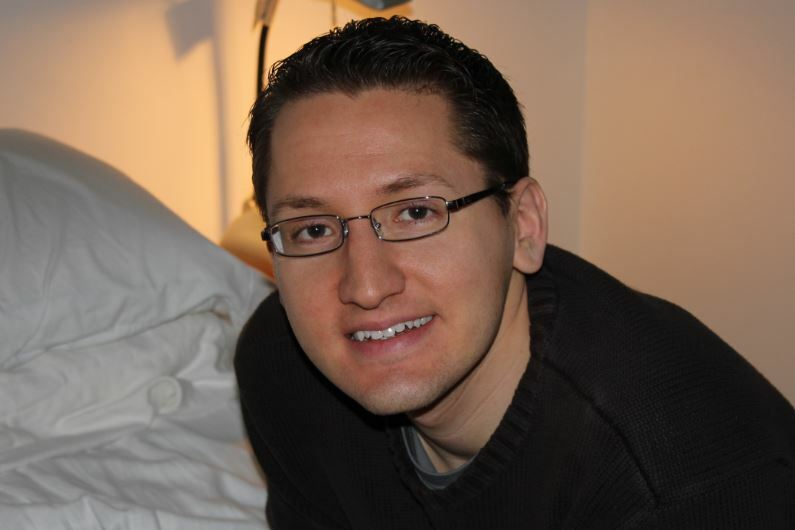 We are thrilled to introduce Travis Allen as a new contributing author for MTGprice.com. Travis maintains a blog at http://travistyofmagic.blogspot.com and can be found on Twitter as @wizardbumpin. Welcome Travis! With the release of Modern Masters, the MTG community is seemingly awash with high-quality Rares and Mythics, many of which are at the cheapest they have been in years. I’m here to tell you that this is about the lowest price point we’ll see many of these cards for quite some time. My expectation is that MM will ultimately raise the price of many tournament staples and unique cards rather than deflate them. At base, price is a factor of supply and demand. In MM’s case, I believe the increase in demand will be greater than the increase in supply. Consider your newer player that started sometime around Innistrad or Return to Ravnica. We know Magic has seen explosive growth in the last several years – there were something like 365 players at a recent PTQ in Toronto, which Brian Kibler remarked is larger than a GP he won there previously, and GP Vegas is set to be close to 4,000 players. These new players have been accumulating Standard cards for a while, and maybe even picking up a few Modern cards here and there. Now MM comes out, and all those cool cards the veteran players at their local store talk about are right there, in trade binders and in display cases. If our new player is particularly lucky, maybe he or she even gets to draft the set. 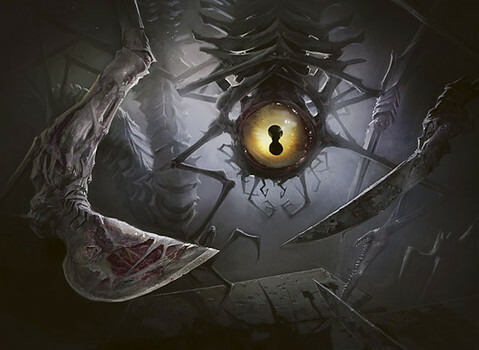 After a taste of the power of an eternal format, and with the Modern PTQ season 6 months away, the player decides to start picking up cards so he can play in January. 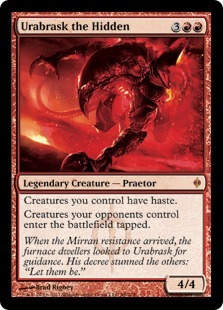 Part of his plan includes obtaining a playset of Tarmogoyfs, a Grade-A Tier-S Format-Megastar Dash-Heavy staple. Consider the average store. How many Tarmogoyfs were in their allocated product? I’d be willing to guess that most stores saw in the range of 3 to 8 Tarmogoyfs total in all of the boxes of MM they received. That means most stores would see about one to two playsets of Tarmogoyfs. Two months ago, a lot of these players didn’t even factor into the demand for Modern. They didn’t have Modern cards, and they didn’t want Modern cards. (Think of it like the unemployment rate: the people that aren’t looking for work don’t factor in.) But with the MM release, they are now trying to get involved, so they’ve entered the market. Demand has increased significantly, but the supply is nowhere near enough to compensate. The best way to consider this is playset-per-player. 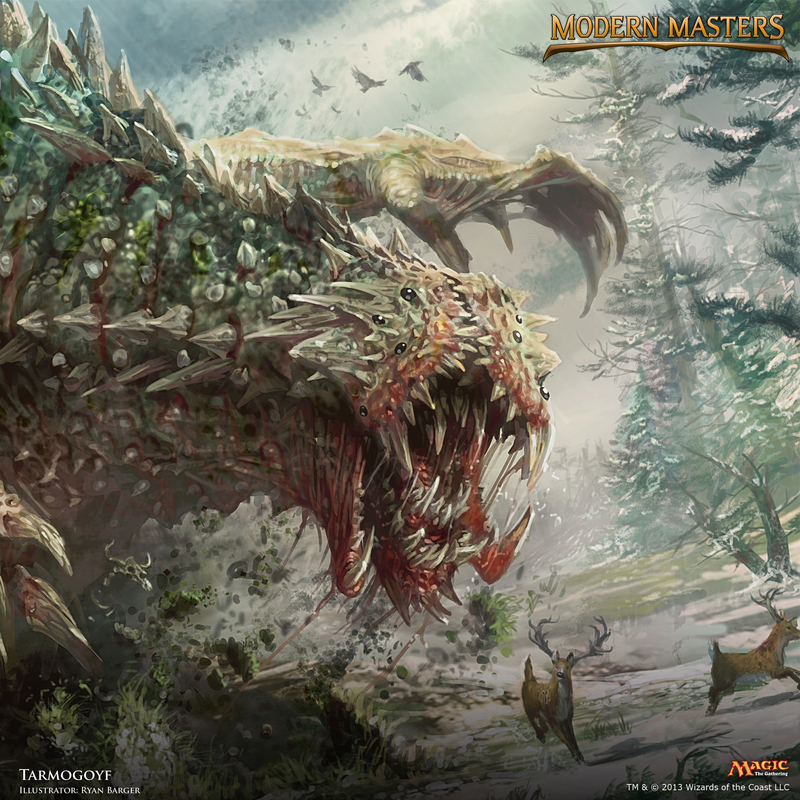 For each playset of Tarmogoyfs that has been opened from MM packs, how many players do you think have decided they want to pick up a set? As long as it’s more than one, there is now a net increase in demand for Tarmogoyf, as opposed to reducing the strain on the limited supply. I would expect the Grade-A Mythics and Rares – cards like Tarmogoyf, Vendilion Clique, Dark Confidant, and Arcbound Ravager, as well as any new art – both swords, for example – to follow a pattern of minimal to no losses now followed by growth beyond their original price points by January. The supply of these cards is currently greater than it has ever been, and with Modern PTQ season a ways off, not everybody will have turned their attention to the singles they need yet. Once January rolls around, and most of the MM inventory has migrated to binders of players that were savvy enough to pick it up early, demand will begin to skyrocket. I would also pay close attention to any foils in these categories, especially alternate art cards. Foil Sword of Fire and Ice is already higher than both the original pack foil and the judge promo, and I don’t expect that to change. 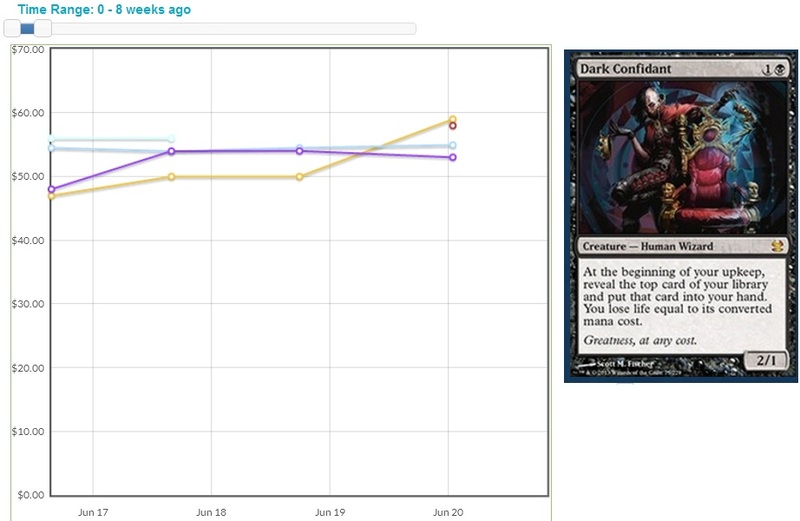 Other cards that are Legacy and EDH staples have seen more drastic price suppression, and may not ever recover. In their case, more copies have been added to the market, but the demand for them hasn’t seen any real increase. 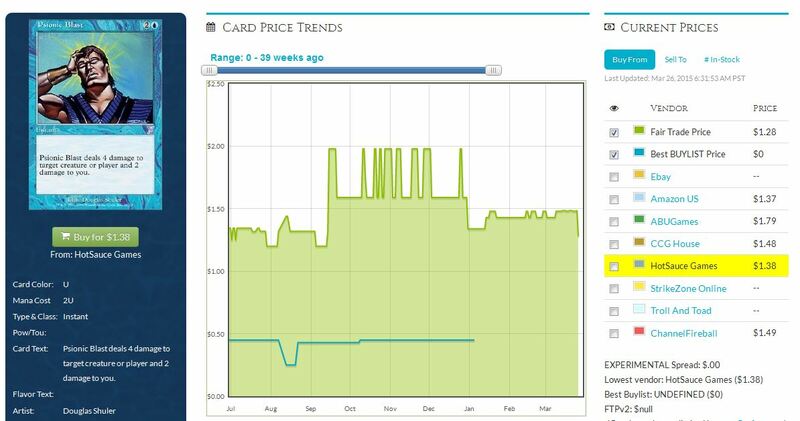 Meanwhile, Uncommons have already seen price reduction almost across the board, and while their dip in value may last longer than the Rares and Mythics, I anticipate most will be back to their original prices by PTQ season, or quite possibly higher. 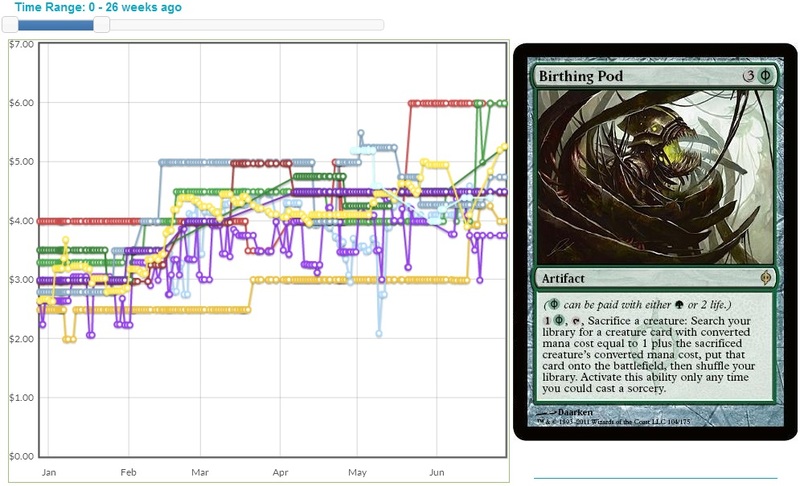 Similarly, any alternate-art foil Uncommons will get out of control quickly. For those that were hoping Modern Masters would squash the price barrier of the format, I’ve got news for you: the wall isn’t getting any lower. If you need Modern cards, now is the time to get in. The supply of these tournament-grade cards has never been higher, and demand is temporarily tempered by a distant PTQ season. 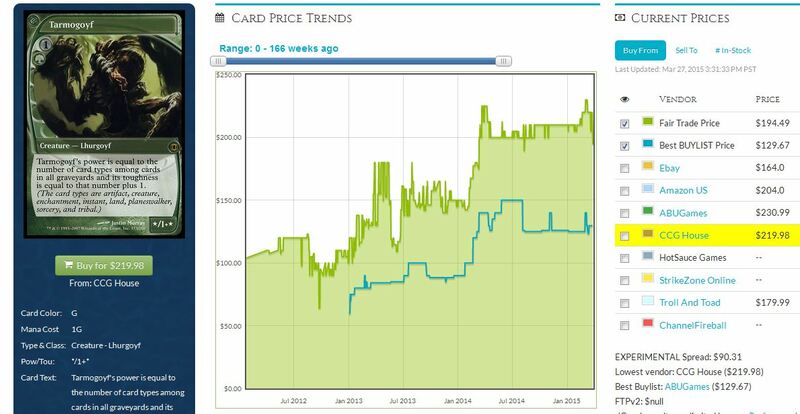 By January, however, expect a significant rise in prices across the board, even on cards in Modern Masters. And what of the staples that haven’t been reprinted by then? Some of those price points may seem downright Vintage.